2017 was a good year for riding. Busy with work on the new house I only managed 39 rides during 2016. I looked forward to 2017 as the year to reboot by riding and get some quality miles in. A few days of sunshine during February. But February was a rainy month. It seemed like most of 2017 was spent trying to figure out how to best prepare for the varied road conditions along the Central Coast. My old Ford Escape was sitting collecting dust and the battery kept dying from non-use. So I sold it and we became a one car household. First I made sure our Ford C-max would hold the 700 inside. It did. Now with only one small car I needed a backup plan for carrying the trike on top of the car when there's no room inside. Getting familiar with the Central Coast and getting to know my favorite spots to take a break. 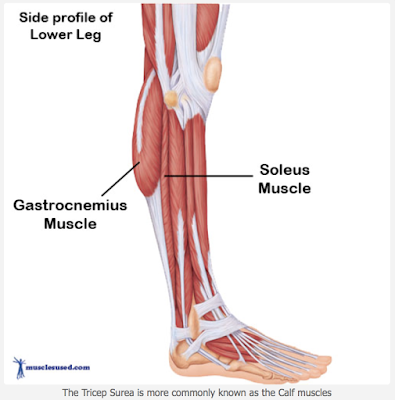 I'm getting use to not having the use of part of my right calf muscle. The ICE Sprint 26fs I purchased late in 2016 spent some time at Bent Up Cycles after I returned it. The carbon seat heard my hips. In August I decided to pick it up and give it another try with a new mesh seat instead of the carbon fiber seat. In September I decided to keep both my 700 and the ICE Sprint. I really wanted the Sprint to work for me but I was still spending more time riding my 700. My 700 is still getting more ride time then the Sprint. I turned my focus back to the Sprint. I played around with the mesh seat until it was comfortable. At least comfortable enough. Who am I fooling? I can't make the ICE Sprint work for me. I gave it a good try. I traded it in for a Catrike Expedition!! I know the Expedition well. It was my first trike. I still feel it's the best and most versatile rike around. It's on order and will be here in January. With the right tires and it's more upright seat position it will be my go to trike for longer rides and rides on rough roads. I traded in my ICE Sprint 26FS for a Catrike Expedition. As I wait to pick up the new Expedition here are some closing thoughts on my experience with the Sprint. Quality engineering - The Sprint is a beautiful machine and beautifully engineered. Hydraulic brake function - The brakes have good stopping power and have a very positive feel. Rack - The custom integrated rack is solid and easy to take on and off. Only two attachment points. Elastomer suspension - The elastomer suspension is a light weight alternative to the heavier suspension found on many other trikes. Looks awesome - The design, color and graphics are second to none. Customer service - Very helpful and fast response time. What I don't like Or more accurately, what wasn't working for me but may be a non-issue for another rider. Seat - See my earlier posts here. Although I eventually managed to make the seat work for me I always had the sensation that I was sitting on the edge of the seat. Cornering - The front suspension does not incorporate a torsion bar to compensate for the pressure on the outboard wheel when making a tight turn. The trike tends to lean away from a turn so take it easy on fast turns and all will be well. Hydraulic brake maintenance - Because of the suspension system the brakes have to mirror each other. Currently the only option for the suspended Sprint is hydraulic brakes. If you loose hydraulic fluid while on the road you're out of luck. I would not recommend hydraulic brakes for touring. Maintaining hydraulic brakes is more involved then mechanical brakes and requires a little extra skill and specialized tools. Lack of bottle holders - The mesh seat, unlike the hard seat, has no place to install extra water bottle holders. All you get is the boom mount for water bottles. You can use a Terra Cycle dual water holder adapter on the boom but then the trike doesn't fold well. Indirect steering - There is nothing wrong with indirect steering. Many riders love it. I personally prefer direct steering. I discussed the matter here on an earlier post. Headrest - Here I feel it helps to compare the ICE and Catrike headrests. While many riders love the ICE head rest and hate the Catrike head rest I'm the opposite. I don't like the ICE headrest. It has only two possible adjustments. Up and down and it can swivel at the base where attached to the seat frame. 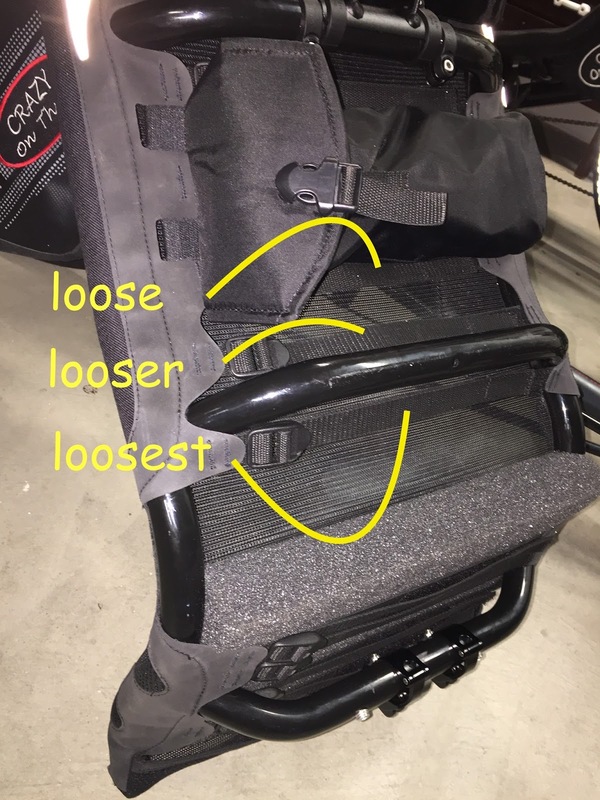 The Catrike headrest has the same adjustments but in addition the headrest pad itself can swivel to allow for a perfect contact point between head and headrest pad. On another point, I like a firm headrest. I use a headrest about 50% of the time while I'm riding. The headrest is adjusted to be within about 1/2" of the back of my head when I'm not using it. When I put my head back I don't want to sink into a cushy headrest that puts my head at an awkward angle. The ICE headrest lacks a firm backing on the pad and my head sinks uncomfortably into the rest. The Catrike headrest has a firm backing and a just the right amount of cushion for my needs. If it just had a little more width and dished in the middle it would be perfect. I've spent a lot of time talking about headrests. Regardless of your headrest preferences a good headrest is important for a good ride. - The folding option was not important for me. I have a Ford C-max and my Catrike 700 easily fits into the car when I take the rear wheel off. The Sprint takes up less room inside the car but requires a bit of effort to fold and unfold. - The carbon seat I originally had on the trike looked cool but it's a hard seat and negated some of the benefits of riding a suspended trike. In addition my titanium hips rebelled when using the carbon seat. That post here. Nothing better then a easy ride along the Central Coast. Beautiful ride yes, but not as easy as some are expecting. 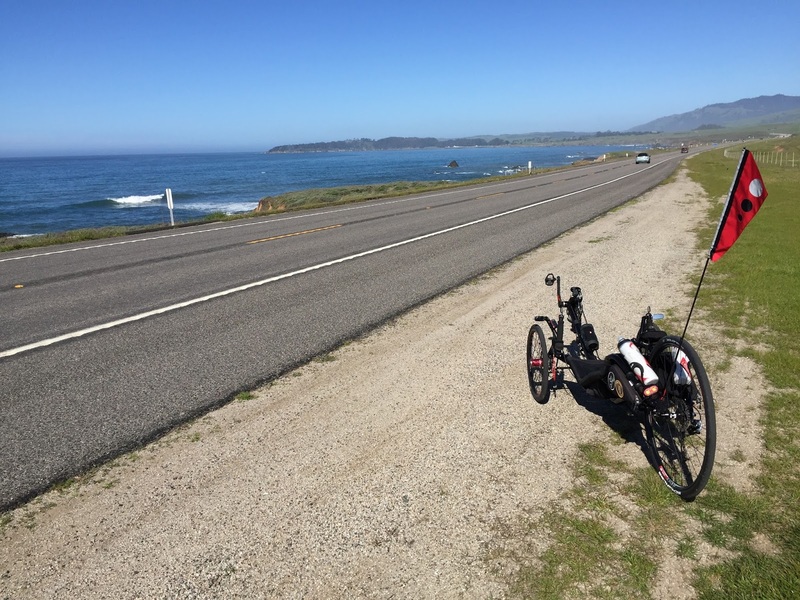 Many first time visitors who come to the Central Coast to take a casual ride along the coast line are generally not prepared for the rollers and occasional long climb. A 1,309 foot overall gain awaits them on the 33 mile one way ride from Morro Bay to the Piedras Blancas lighthouse. Nothing to brag about but for those not prepared for climbing it can put a damper on their ride. Add another 1,253 feet of gain if you want to return to Morro Bay. If you keep going North from the Piedras Blancas lighthouse you soon enter the Monterey District of the Los Padres National Forrest and eventually into Big Sur. That's where the real climbing begins. 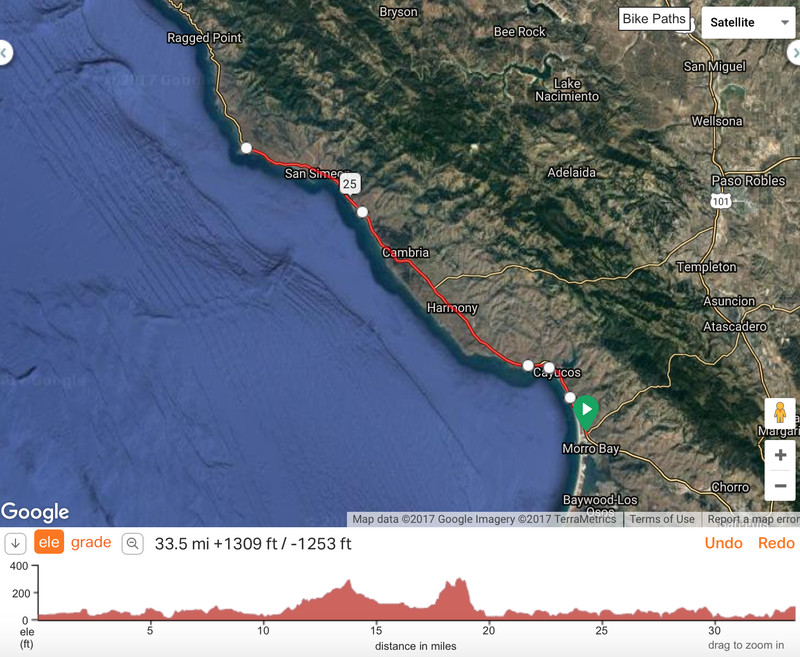 If you keep going North ** another 57 miles to Pfeiffer Big Sur State Park you can expect another 5.537 feet of gain. ** Hwy 1 is closed South of Gorda about 19 miles North of the Lighthouse and is expected to open late summer of 2018. 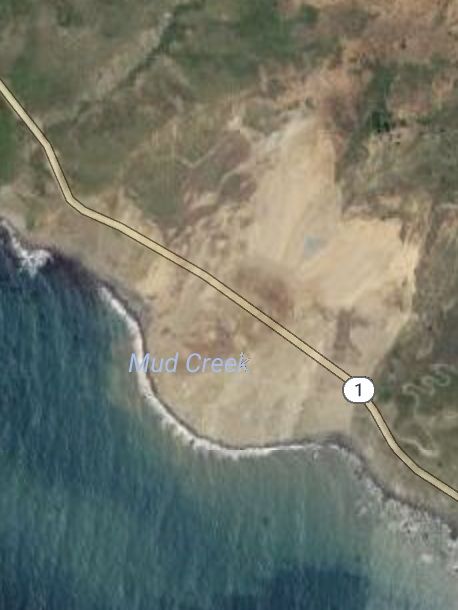 In May of 2017 five million cubic yards of hillside went sliding down into the ocean at Mud Creek. I turned 64 at 3:20 am this morning. So I decided it was about time to update my About Me page. Here it is. I live and play along the Central Coast of California with my wife, my best buddy for life. I'm a proud father of 5 kids and grandfather to 9 little ones. Born in 1953 (you do the math) I created my blog in July of 2009 to share thoughts and information about recumbent cycling as others have shared with me. Also I take a occasional detour into family, hiking and useless musings. 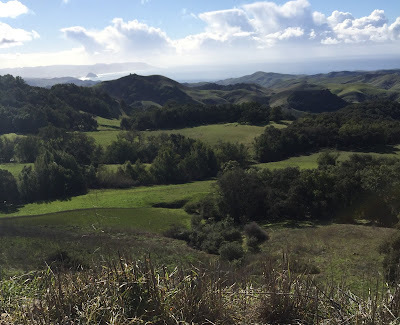 For most of my life I hiked into the hills to think more clearly. Whether hiking locally or somewhere more distant, by myself or with my kids, I always imagined that I’d be hiking until my time here on Earth expired. My time here on Earth is far from over. There is a lot that I still want to do and see, but I'm wearing out. I've lived a very physical life and now it's caught up with me. The medical profession has put my shoulder back together, twice removed torn cartilage from my knee, put the scalpel to my feet to put them back in good working order, repaired my lower and middle back, provided me with new hips which left me the loss of part of my calf muscle because of nerve damage from the hip replacement. It also left me with heterotopic ossification in my right hip and constant general soreness of the pirifomis muscles. All topped off with a heart attack on Christmas day of 2011. In December of 2017 I turned 64 and even though my party parts may be wearing down I'm still going strong. After my heart attack in 2011 I weened myself off meat and turned to a vegetarian diet while at the same time taking whatever drugs the doctors told me to take. My one mouth disastrous affair with statins for cholesterol after my 2011 heart attack convinced me that pharmaceuticals are to be looked at with caution. I was soon off all drugs related to my heart attack. I control my colestoral and maintain a healthy heart and body through a common sense diet. I'm 6'1" and weight 190 lbs. I ride my trike 10 to 12 times a month. I exercise at least every 5 days using some weights and old fashion calisthenics. And I stretch everyday. I take turmeric to keep the blood flowing and general heart health, vitamin D3 for heart health (old skin doesn't produce vitamin D like young skin) and Ibuprofen as needed. I also let big pharma make a little money off of me. I take an inhaler for mild asthma (growing up in a house full of cigarette and cigar smoke didn't help) and about every 3 months my doctor gives me a prescription for 20 low dose hydrocodone tabs for the days when I do too much heavy lifting or just do something stupid. In early May of 2009 Dana at Bent Up Cycles showed me what recumbent tadpole trikes are all about. 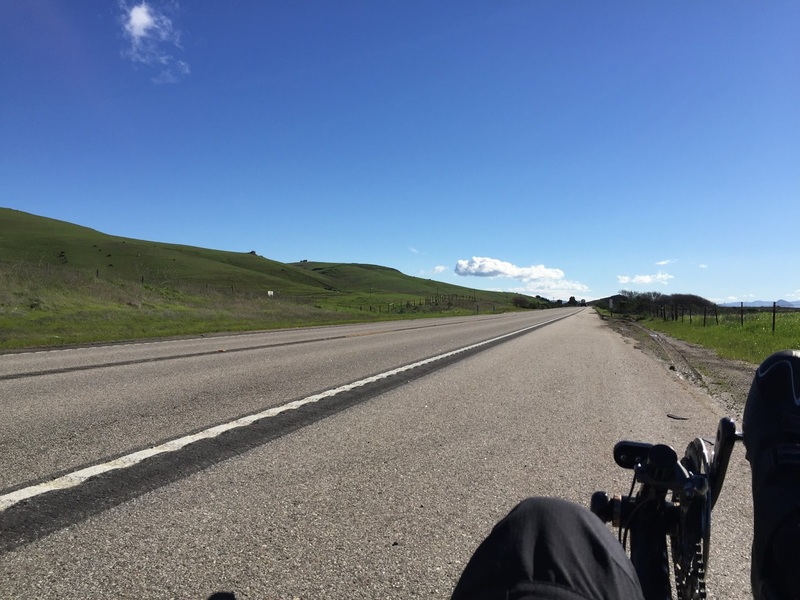 Their knowledge of recumbent trikes put me at ease that I could transition from hiking to recumbent cycling. My first ride was a Catrike Expedition. It was soon followed by a Catrike 700 which was later upgraded to the new version of the Catrike 700 with 20' front wheels. It looks like I'm a die hard Catrike fan and I finally decided to trade in my ICE Sprint 26fs for a Catrike Expedition. 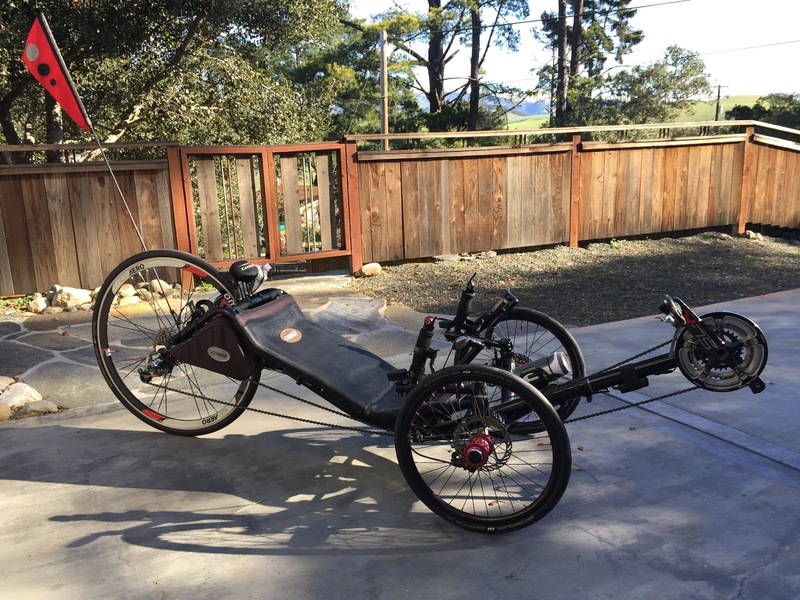 I gave the Sprint a fair try but in the end I decided the Catrike Expedition is the right trike for me. The Sprint is now available at Bent Up Cycles in North Hollywood, CA. I'll post some final comments on the ICE Sprint 26fs in another post. For now here's all my posts about the Sprint from the last 14 months. Soon the Catrike Expedition will join my Catrike 700. Roads and routes will determine which trike I ride on any given day. The Sprint is loaded on the top of the car with the seat removed and ready for a four hour drive to Bent Up Cycles. There was no room inside the car for a folded Sprint. The car was loaded with other non-trike stuff inside. A close up of the Seasucker suction cup I use to securely hold the back wheel. When climbing HWY 46 I travel light with my Catrike 700. With a 19 inch low gear and a light trike climbing is relaxed , slow and steady. My motivation to climb is the anticipation of turning around for a fast punker up downhill run. It's not necessary to always shoot for the top, there's plenty of good downhill riding. Except for two very short rough patches the road is in excellent condition with gentle turns that make braking unnecessary. But I keep hands close to the brake levers as speeds edge up over 50 mph. I've even cheated before and let Carrie drive me to the top. I unload the trike about 100 yards from the top so I can warm up my legs on a short climb and then let go and have fun. I may be turning 64 in a few days but I still like the rush of going fast while laid back just a few inches off the ground. 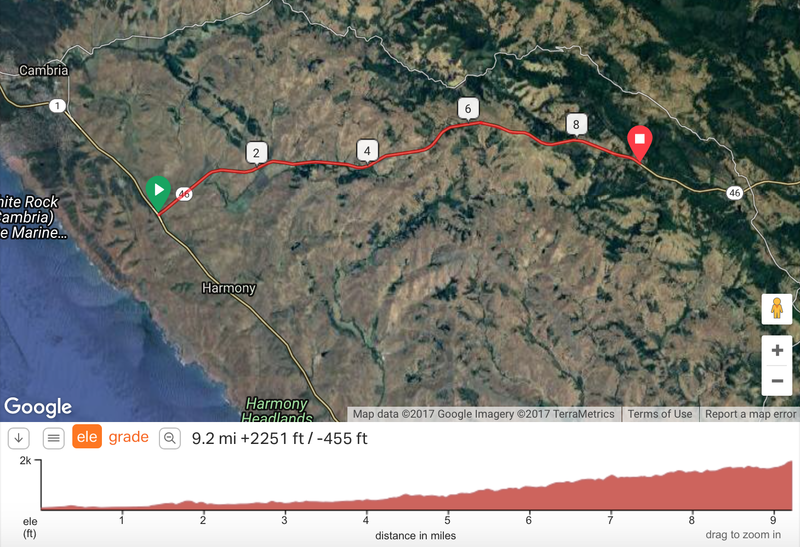 Profile of HWY 46 starting at HWY 1 and going to the top. 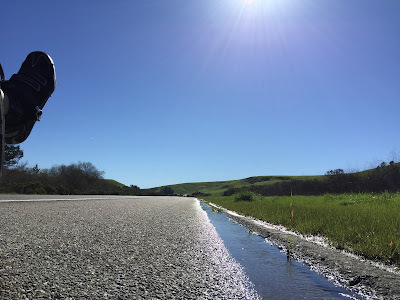 My motivation for adding a suspended ICE Sprint FS to accompany my Catrike 700 in my garage was the many miles of chip seal I have to ride when venturing North of Cambria on HWY 1. Which is usually once a week. I've now had plenty of time to experiment with tire selection and pressure, suspension vs non-suspension and seat angle. I've come to the conclusion that seat angle plays the biggest role in determining the level of comfort when riding the many miles of chip sealed roads. For me a seat angle of 37 degrees to 40 degrees is the most comfortable position on these roads and still allows for good power transfer to the pedals. I've been trying to negotiate a compromise between comfort and speed. So I went with the minimalist suspension of the ICE Sprint with 28mm Durano tires. But I found that my Catrike 700 with 35mm Kojaks do nearly as good a job as the elastomer suspension system of the Sprint in isolating the constant vibration of the chip seal. The Sprint elastomer suspension works nicely on the occasional rut, road seam and the minor road imperfections. And it's probably great for trail riding. But it's the chip seal I'm trying to tame without sacrificing too much speed. With my titanium hips I may be a slow dog on hills but when the road levels out I like to feel the speed. Especially down hills. And on those days when I choose to cruise the coast loaded with creature comforts I don't want to push extra weight that's not benefiting me in any meaningful way. I'm tending to think that the whole suspension craze is overrated. There is a definite need for a suspended ride but you have to remember it comes at the cost of a heavier and mushier trike that requires more calories to per mile. Now that I've figured out that seat angle makes the biggest difference on rough roads, it's time to re-examine the non-suspended option that I was considering earlier, the Catrike Expedition with it's 37 degree seat angle. I feel it's the best and most versatile trike on the market. Also it won't empty your bank account. days. Now I prefer to ride a little lighter.